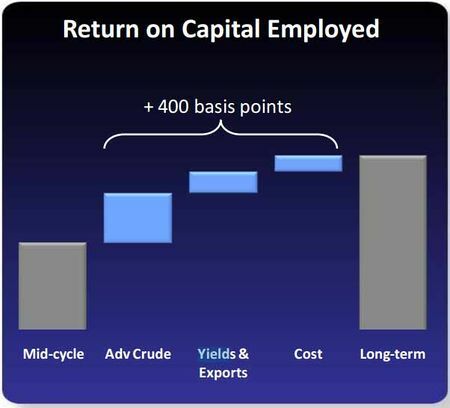 Greg Garland told security analysts at the Credit Suisse Global Energy Summit on February 12, 2014 that there are five things Phillips is doing to in refining and marketing in to enhance returns and capital efficiency. "We think we have 400 basis points of improvement in ROCE in this business and there's five things that we're doing to drive that." Garland told analysts at Barclays CEO Energy-Power Conference on September 3, 2014 that the refining business is run well, optimized business. "Operating excellence is key. Putting advantaged crude to the front of refineries, working our yields, improving our yields at our refineries and working on our cost structure is the key of what we're trying to accomplish here. $13 billion of capital employed in this business, it's a huge base. And when you think about 400 basis points of improvement in a business of this scale, that's huge. It's about $600 million of net income improvement. $400 million of that comes from advantaged crude capture, $200 million is around yields and cost reduction. So significant improvement in our base refining business. We view this as moving from a 10% to a 14% return on capital employed business." Steps Phillips will take to improve returns by 400 basis points. Graphic from Phillips 3rd Quarter Presentation to Analysts on December 12, 2013. Greg Garland told security analysts at the Credit Suisse Global Energy Summit on February 12, 2014 that Phillips will get more advantaged crude in front of refineries. "We're well on our way. Last year, we're 74%, up 10%. As you move to into the fourth quarter, we pushed that up to 90%. So our real opportunities are the East Coast and the West Coast today. I think we've got good advantaged crude in the midcon and in the Gulf Coast, where 51% of our or 55% of our capacity resides today." 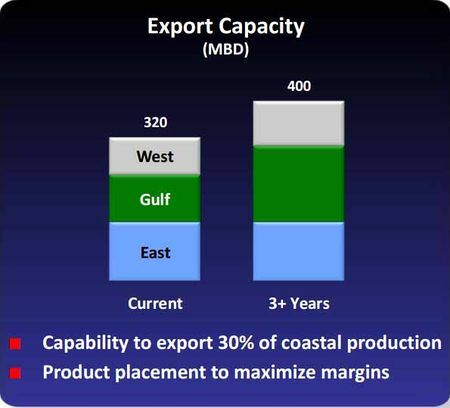 Graphic from Phillips Presentation to USB Global Oil and Gas Conference May 21, 2013. Phillips announced during their earnings release on July 29, 2016 that the Billings Refinery is increasing its heavy Canadian crude run ability to 100 percent. This project is expected to be complete in the first half of 2017. Greg Garland told analysts during the 2016 second quarter earnings conference call on July 29, 2016 that at the Billings Refinery, efforts are underway to increase the amount of heavy Canadian crude we can run to 100%. At Bayway, work on the FCC modernization is progressing. These are all high return, quick payout projects." Greg Garland talked at the Bank of America Merrill Lynch 2016 Refining Conference on March 3, 2016 about some of the optimizing strategies Phillips 66 is utilizing across their system to improve refining margins through selective investments including a $200 million capital project to debottleneck some of the light ends constraints Phillips has at Wood River Refinery so the refinery can run more heavy crude. "When we think about our base refining business, it is a run-well and optimize strategy. It’s manage your costs well, manage your capital well going into this business, and improve your margins through selective investments. You can see we’re spending a little more in refining in 2016. We’re giving you an idea of some of the projects that we’re executing. We have opportunities across the system; at Wood River, we’ve got some de-bottlenecking, essentially to debottleneck some of the light ends constraints we have at Wood River so we can run more heavy crude. We’re going to upgrade the FCC at Wood River, about a $200 million capital project all in, $100 million of EBITDA, so 2 times build multiple, 30-40% return project." Greg Garland talked at the Bank of America Merrill Lynch 2016 Refining Conference on March 3, 2016 about some of the optimizing strategies Phillips 66 is utilizing across their system to improve refining margins through selective investments including a $150 million project to upgrade the FCC at Bayway Refinery. "As you look at Bayway, we have the opportunity to upgrade the FCC at Bayway. It’s the largest FCC in the northern hemisphere, but it’s like a 1957 Chevy. So we can improve the yield there and make more Phillips 66 gasoline coming out of that, it’s about a $150 million project, $75 million of EBITDA." 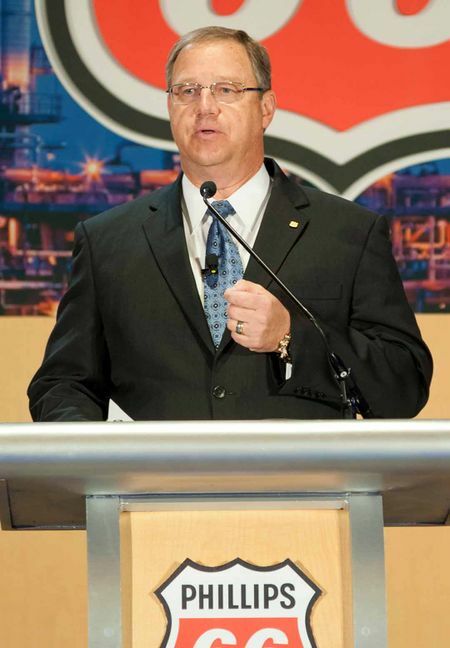 Greg Garland talked at the Bank of America Merrill Lynch 2016 Refining Conference on March 3, 2016 about some of the optimizing strategies Phillips 66 is utilizing across their system to improve refining margins through selective investments including a $300 million project to help move the Billings Refinery to 100% Heavy. "At Billings, we’re moving to 100% heavy. Also run higher tan crude at Billings, $300 million project, $125 million EDBITA. So you can see these are great projects, great build multiples in excess of 30% return on these projects." Argus reported on September 10, 2015 that Greg Garland told the Barclays CEO Energy Conference on September 9, 2015 that Phillips 66 expects to take Bakken crude shipped by pipeline to the Texas coast and move it by ship, either to its own facilities at the Bayway Refinery in New Jersey or abroad. Garland added that shipment on one of Phillips' Jones Act vessels will be competitive with rail. 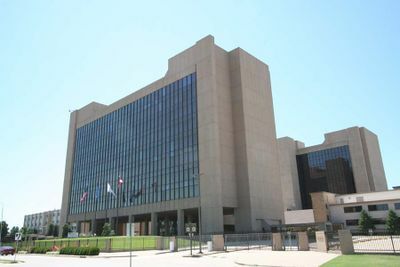 According to Garland the combination of a 25pc interest in 450,000 b/d of pipeline capacity connecting North Dakota fields to the Texas coast and the Beaumont terminal will offer a new, competitive path for midcontinent crude. The Dakota Access Pipeline and Energy Transfer Partners Crude Oil pipelines would come online late next year. 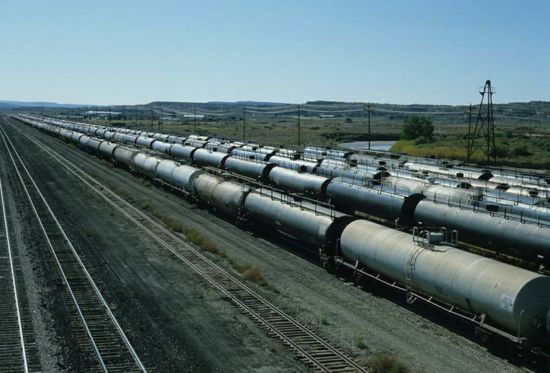 Retuers reported on September 1, 2015 that oil tank cars - a year ago sought-after to haul crude from North Dakota to New Jersey - now stand idle as a result of two converging trends: the reversal in U.S. shale oil production and the completion of new pipelines. Big rail lines, such as Berkshire Hathaway-owned BNSF Railways or Union Pacific are losing what used to be their fastest-growing source of new traffic; refiners such as PBF Energy are left with millions of dollars worth of unused rolling stock; and leasing firms such as Trinity Industries and Greenbrier Companies Inc have seen monthly rates fall to a third of peaks above $2000 per car. Phillips 66 has cut oil-by-rail shipments. "We actually set cars on the siding. We brought imported crudes in the system," CEO Greg Garland recently told investors. Reuters reported on September 3, 2014 that Greg Garland told analysts at the Barclays CEO Energy-Power Conference that Phillips has ordered another 500 railcars to increase its fleet to 3,700 railcars. which would allow it to eventually move up to 185,000 barrels per day (bpd) of North Dakota Bakken crude oil to its refineries on the East and West coasts. Reuters reported on March 23, 2015 that Phillips 66 has added trucks and offloading equipment at several of its refineries including the Ponca City refinery to help reduce its reliance on oil coming from Cushing, Oklahoma, the nation's biggest crude oil crossroads and storage hub. At Cushing, a growing volume of Canadian oil sands is often mixed with lighter domestic shale crude, resulting in blends that can be less profitable than similar oil fresh from the field. While the blends of these crudes may technically meet the API gravity ceiling of 42 at Cushing, industry players say the mixes can be inconsistent in makeup and generate less income because the most desirable stuff is often missing. The blends tend to produce a higher proportion of fuel at two ends of the spectrum: light ends like gasoline, demand for which has dimmed in recent years, and lower-value heavy products like fuel oil and asphalt. What's missing are middle distillates like diesel, where growing demand and profitability lies. "You end up with a dumbbell-like material rich in front and back ends, neither of which refineries find most profitable," said Dennis Sutton, a former chemist and retired crude quality expert with Marathon Petroleum Corp who now heads the Crude Oil Quality Association. Phillips 66 executives say operations at its 200,000-barrel-per-day refinery in Ponca City, Oklahoma, only 62 miles (100 km) from Cushing, have improved since it began getting more of its crude directly from wells in the Mississippian Lime shale patch nearby. "That's really the key," Phillips 66 President Tim Taylor told Reuters. "With Cushing, you can get a blended barrel that hits the spec, but it's not as consistent as you'd like." Argus Media reported on March 2, 2015 that Phillips CEO Greg Garland sees the Brent-WTI differential widening to $6-10/bl. Inventories of crude storage at Cushing have gained for 12 consecutive weeks at an average pace of 2mn bl per week. Inventories climbed during the week ending 20 February by 2.4mn bl to 48.7mn bl, the highest level since June 2013. Stock levels have doubled since the end of October, growing at a pace unmatched in more than 10 years of records kept by the Energy Information Administration (EIA). "I believe that Cushing is going to fill or close to fill to the operating level, and that will carry over through a decent portion of the year in terms of impacting inland versus coastal crude differentials," says HollyFrontier chief executive Mike Jennings. Will Buss reported at BDM.com on January 8, 2015 that spokeswoman Melissa Erker of the Phillips 66 Wood River Refinery in Roxana says that falling crude oil prices have not impacted Phillips 66's business because it is not extracting oil from the ground, but purchasing it at a low price. “If we’re paying less for the product and we’re getting less for gasoline, there is really no impact,” Erker said. Argus reported on November 21, 2014 that Phillips 66 received the first unit train of Bakken produced oil earlier this week at its new crude-by-rail facility at its 96,000 b/d refinery in Ferndale, Washington. The 30,000 b/d rail unloading site is designed to unload 54 cars simultaneously. Midstream companies and refiners see Washington state as a growing market for discounted North American crudes and a possible gateway to reach California. All Washington state refiners, including Shell and Tesoro, have invested in rail facilities, and three midstream firms have announced plans to unload crude and transload barrels to ships out of the Port of Grays Harbor. Greg Garland told analysts during the third quarter earnings conference call on October 29, 2014 that during the third quarter, 95% of Phillips U.S. crude slate was advantaged, and this compares with 93% last quarter and this was tied to increased advantaged crude at the Alliance Refinery. "During the quarter, 95% of our U.S. crude slate was advantaged, and this compares with 93% last quarter. This represents a record quarter for us. The improvement was tied to increased crude runs at our Alliance Refinery after their second-quarter turnaround, and was also due to certain crudes becoming advantaged relative to Brent." "Alliance came back on after turnarounds, so you had more exposure to light and medium grades with that," added Tim Taylor. "And then there was less availability of Maya, the crude, and that was backfilled with more light medium. So we had a mix - effect that gave more exposure to light medium versus heavy in the third quarter." Greg Garland told analysts during the third quarter earnings conference call on October 29, 2014 that in August, Phillips began operations at its 75,000 barrel a day rail rack at the Bayway Refinery. "We're constructing a rail loading facility with up to 200,000 barrels a day of capacity in North Dakota. In August, our Company began operations at its 75,000 barrel a day rail rack at the Bayway Refinery, and the 30,000 barrel a day rail rack at our Ferndale Refinery is in the commissioning phase. This quarter, we improved our advantaged crude capture to 95%." Garland added that even with the rail rack coming online, Phillips would continue to barge Gulf Coast crude over to the East Coast. " I think we'll continue to do both. We've actually run the Jones Act ship up around the Bayway also, and so I think you'll see us continue to do both." DAPL is expected to deliver in excess of 450,000 barrels per day of crude oil from the Bakken/Three Forks production area in North Dakota to market centers in the Midwest. DAPL will provide shippers with access to Midwestern refineries, unit-train rail loading facilities to facilitate deliveries to East Coast refineries, and the Gulf Coast market through an interconnection in Patoka, Illinois, with ETCOP. ETCOP will provide crude oil transportation service from the Midwest to the Sunoco Logistics Partners and Phillips 66 storage terminals located in Nederland, Texas. Greg Garland told analysts at the Barclays CEO Energy-Power Conference on September 3, 2014 that Phillips is adding another Jones Act Vessel to its fleet. "And logistics around the Gulf Coast are going to be important and an opportunity to create a lot of value. We currently have two Jones Act vessels that we use. Starting in January, we're adding a third Jones Act to the fleet. So we've added capability there coming up this January." Garland added that Phillips can use their Jones Act Vessels to move crude oil from the Texas Gulf Coast to Bayway. Argus reported on September 3, 2014 that Greg Garland told analysts at the Barclays CEO Energy-Power Conference that Phillips will build a rail-loading facility permitted to handle up to 200,000 b/d of Bakken crude, the first time a US refiner has directly owned a North Dakota origination terminal. "The thing I would say is in terms of North Dakota, we acquired 700 acres of land. We have permits in hand and engineering to construct a new rail loading facility. This is permitted up to 200,000 barrels a day. We'll probably do about a 160,000 barrels a day, about 300,000 barrels of storage there." Reuters reported on September 3, 2014 that Greg Garland told analysts at the Barclays CEO Energy-Power Conference that Phillips has ordered another 500 railcars to increase its fleet to 3,700 railcars. which will allow it to eventually move up to 185,000 barrels per day (bpd) of North Dakota Bakken crude oil to its refineries on the East and West coasts. Reuters reported on September 3, 2014 that Greg Garland told analysts at the Barclays CEO Energy-Power Conference that Phillips was "disappointed" in the lengthy permitting process for a rail offloading project at its refinery in Santa Maria, California, but remained optimistic it would be built. The rail project would bring in about 40,000 bpd of heavy oil, like that produced in Canada rather than light Bakken crude, according to the company. 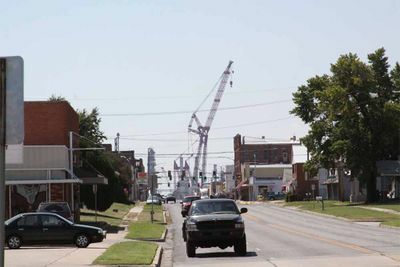 A local planning commission meeting to consider approving the project has been pushed to January from April to allow an environmental impact report produced in late 2013 to be recirculated for more public comment. Reuters reported on September 3, 2014 that Greg Garland told analysts at the Barclays CEO Energy-Power Conference that Bayway Refinery in Linden, New Jersey, received its first crude-only train at the plant's newly expanded offloading system. The system can take up to 70,000 bpd, in addition to up to 75,000 bpd from a joint venture with Global Partners. "So let me start on the East Coast at Bayway. We've built the 70,000 barrel a day rail rack. It's operational. We unloaded our first unit train in August, August 5. We can do one unit train a day there at Bayway. That was a global deal. We can do 50,000 to 75,000 a day in the global deal. And then we have our Jones Act vessels also to move crude around from the Texas Gulf Coast to Bayway." Reuters reported on September 3, 2014 that Greg Garland told analysts at the Barclays CEO Energy-Power Conference that Phillips 66's 30,000-bpd offloading system at Ferndale Refinery is on track to start up in the fourth quarter. "Thinking about California, work in process, I would say, in terms of putting advantaged crude into California. Ferndale, we have a rail rack under construction, 30,000 barrels a day. It will be ready by the fourth quarter of this year. We're disappointed in the progress to permit our Santa Maria rail rack 40,000 a day, but we have – we're optimistic that we'll get that done. It just takes time in California to get these things permitted." Greg Maxwell told analysts during the 2nd quarter earnings conference on July 30, 2014 that narrowing crude differentials negatively impacted Phillips realized margins. "Realized Refining margins decreased in all of our regions exception for the Western Pacific region. The decrease was driven by weaker distillate market cracks reduced seasonal blending activity, gasoline activity and also lower secondary product realizations," said Maxwell. "In addition, narrowing crude differentials negatively impacted our realized margins. In the Gulf Coast, the LLS Maya differential narrowed by $5.32 per barrel, impacting our Sweeny and our Lake Charles refineries. And on the East Coast the Bakken Brent differential narrowed by $1.43 per barrel impacting our Bayway refinery." Isac Simon writes at "The Motley Fool" that with the Cushing Marketlink pipeline coming online in late January, inventories at the Cushing storage hub of the West Texas Intermediate have eased causing the Brent-WTI spread to shrink to less than $7 a barrel. "Since the two most widely traded crude oil benchmarks diverged in late 2010, a narrowing spread between Brent and WTI has never been a good sign for refiners," writes Simon. "Throughout 2012 and during the fourth quarter of 2013, U.S. refiners enjoyed a solid run -- thanks to the availability of the deeply discounted West Texas Intermediate crude oil when compared against the internationally traded Brent. As a result, refiners such as HollyFrontier, Marathon Petroleum, Valero Energy Corporation, and Phillips 66 could buy cheaper feedstock, while maintaining global prices for refined products." However sour and heavy variants of crude oil are much cheaper than their light and sweet counterparts and higher volumes of heavy crude -- or bituminous crude -- from Canada's tar sands are slowly making way by rail to the Gulf Coast where most refineries are located according to Simon. "Phillips 66 is expecting 2,000 railcars to be delivered in 2013-2014. These high-capacity railcars will be used primarily to deliver Bakken crude oil to its Bayway and Ferndale refineries. Out of its 11 refineries in the United States, eight are capable of refining heavy sour crude," writes Simon. "Both Canadian crude and the price-advantaged Bakken sweet crude are trading at a discount to the West Texas Intermediate. So while the Brent-WTI spread may be narrowing, there's a different market force at work -- that of directly transporting cheap crude by rail. The better prepared refiner is well on its way to take advantage." Greg Garland told security analysts at the Credit Suisse Global Energy Summit on February 12, 2014 that Phillips will get more advantaged crude in front of refineries. "We're well on our way. Last year, we're 74%, up 10%. As you move to into the fourth quarter, we pushed that up to 90%. So our real opportunities are the East Coast and the West Coast today. I think we've got good advantaged crude in the midcon and in the Gulf Coast, where 51% of our or 55% of our capacity resides today. We're working on our clean product yields. There's $60 million to $100 million of value creation there by pushing our yields. We're working on decreasing operating costs and then we're working on portfolio management in terms of rightsizing the portfolio." ""We have an extensive system of railcars, pipelines, barges, access to ocean-going ships. We're using that in the value capture for advantaged crude to the front end of our refineries," said Garland. "You'll see us expand this system over time. You'll see us add more railcars, more unloading capability and we're working the East and West Coast right now. Bayway we have the rail rack at Bayway. 75,000 barrels a day will come on later this year. On the West Coast, we have the rail rack at Ferndale that'll come on later this year, 35,000 a day. We're in the middle of a comment period on permitting for our Santa Maria rail rack. We're actively working other third-party rail unloading facilities in southern California. Greg Garland told analysts at the 4th quarter earnings conference on January 30, 2013 that 94% of Phillips' US crude slate was advantaged. "Our realized margin was $10.75 per barrel, with a market capture rate of 112%. The global crude utilization rate was 92%, and our clean product yield was 84%. During the quarter, 94% of the Company's US crude slate was advantaged, and this compares with 66% last quarter. The increase was largely driven by additional domestic crude's consistently trading at a discount to Brent. We will cover this in more detail on slide 13. The 2013 adjusted return on capital employed for refining was 13%, and the average capital employed for this segment was $14.3 billion," said Garland. "On an annual basis, our advantaged crude slate has increased from 62% in 2012, to 74% in 2013. And this is due to processing an additional 118,000 barrels per day of tight oil, additional domestic crude's that consistently trade at a discount to Brent, as well as higher volumes of heavy Canadian crudes." Reuters reported on October 30, 2013 that Garland told analysts during the third quarter earnings conference call that Phillips may buy more railcars to move advantaged crude from North Dakota and Canada to its refineries. This would be on top of the 2,000 railcars already expected for delivery this year of which the company has to date received 1,270. Phillips Bayway refinery had been running about 100,000 barrels per day of U.S. crudes in place of imports - from Texas via tanker and North Dakota's Bakken via rail and barge but the company cut rail shipments to 30,000 bpd day when the discount of U.S. crude benchmark West Texas Intermediate to London's Brent all but dried up during the quarter. The discount of North Dakota Bakken crude to WTI also narrowed. However, Phillips 66 is ramping rail shipments back up and running less imported crude now that the spread has widened to more than $10 a barrel. "The spreads now incent us to run Bakken at Bayway today," said Tim Taylor, executive vice president for commercial, marketing, transportation and business development, in a post-call interview. Phillips 66 is building a new rail offloading facility at Bayway to further increase shipments by 75,000 bpd by the second half of 2014. The company also received all necessary permits to build a similar facility at its 100,000 bpd refinery in Ferndale, Washington, to handle 30,000 bpd also by the second half of next year. FuelFix reported on July 131, 2013 that Phillips underperformed in the second quarter as its earnings dropped 19 percent because of higher costs for oil and outages that shut down key facilities. “We should have run better and our earnings results reflect this,” said Garland. Phillips 66′s adjusted earnings per share of about $1.50 was well below analyst expectations of about $1. 81 for that figure. Higher domestic oil prices pushed down profits as the gap between the price of West Texas Intermediate, a benchmark for domestic crude, and Brent, a measure of international oil prices, narrowed substantially during the second quarter. That trend is expected to continue through the remainder of the year, with Brent currently around $107 and WTI at about $105. U.S. refiners had previously enjoyed a huge advantage over their foreign competitors because WTI prices were as much as $20 lower than Brent prices , with some U.S. crudes priced far lower because there was limited access to foreign markets. FuelFix reported on July 31, 2013 that Phillips has already taken delivery of 650 rail cars of the 2,000 that they ordered in 2012. “These cars will be used to transport advantaged crude to Phillips 66 refineries on the east and west coasts," said Garland. “Phillips 66 has been an early mover on adding logistical infrastructure to improve its flexibility of taking lower cost domestic crudes to refineries across its portfolio and this flexibility we believe will lower their feedstock costs over the long run,” said Jeff Dietert, and analyst for Simmons & Co. International. James Hamilton reports on Econobrowwer that on July 19, 2013 West Texas Intermediate sold for the same price as Brent for the first time in almost three years. "Since 2010, infrastructure for transport and delivery of crude to U.S. refiners by rail and barge has grown tremendously," writes Hamilton. "This has narrowed the Brent-WTI spread, but is not enough to eliminate it, since pipelines are an economically more efficient (and environmentally more friendly) way to transport oil." However Hamilton adds that other projects will also likely soon be bringing even more oil from Canada and the U.S. into Cushing including the 600,000 b/d from the South Flanagan project and another 800,000 b/d that could be delivered through the proposed Canada-to- Nebraska leg of the Keystone project. "All of this means that the elimination of the Brent-WTI spread may prove to be a short-lived phenomenon." Greg Maxwell, Executive Vice-President for Finance and Phillips CFO, told analysts at the UBS Global Oil and Gas Conference on May 21, 2013 that the first and largest lever in improving earnings is increasing advantaged crude processing. "We are well-positioned to utilize the emerging advantaged crudes in our domestic refineries. For example, from a sensitivity perspective, $1 per barrel change in our crude cost, if we can capture $1 a barrel change, that improves our net income by $440 million per year. And already, we're running shale crudes at eight of our domestic refineries. We increased our advantaged crude runs from 52% in 2011 to 62% in 2012, and 68% in the first quarter of this year. These crudes are being delivered via truck, and being delivered by rail, barge, ocean-going vessel, and also by pipelines. And our plan is to be able to run 100% advantaged crudes within the next few years." Fox News reported on May 1, 2013 that Phillips has been working to increase its use of relatively cheap crude by building rail capacity at its plants and buying rail cars to help bring crude from shale formations not yet reached by pipelines and the company has been inching toward the goal of processing only discounted crudes extracted in North America, a target they expect the company to hit within the next few years. "Certainly its an aspiration, but it is concrete and achievable," said Tim Taylor, executive vice president for commercial, transportation, business development and marketing. Phillips 66 said it boosted the share of discounted crude produced in the U.S. and Canada that its refineries process to 68% of its feedstock, up from 60% last year and during the quarter, it processed 221,000 barrels per day of crude from the Eagle Ford, Bakken and Mississippi Lime formations, up 120,000 barrels per day over last year's first quarter. Eliot Caroom reported on Bloomberg on March 20, 2013 that Phillips will increase deliveries of cheaper crudes to its refineries nationwide by as much as 130,000 barrels a day under three transportation deals and a new investment. First is a three-year deal with Enbridge Energy Partners LP for loading rail cars with up to 35,000 to 45,000 barrels a day of Bakkan crude from Enbridge’s terminal in Berthold, North Dakota. The crude will be delivered to Bayway Refinery on the east coast and Ferndale Refinery on the West Coast. Some crude could also be sent to Gulf Coast refineries at Lake Charles, Alliance, and Sweeney. Second is a pact with Targa Resources Partners LP (NGLS) for five years to provide rail-unloading and barge-loading services in Tacoma, Washington for about 30,000 barrels a day of U.S. and Canadian crudes that will go to the Ferndale Refinery. Phillips’s Rodeo refinery near San Francisco could also receive crude deliveries, displacing imports from outside North America. Greg Garland told analysts at the 4th quarter earnings conference on January 30, 2013 that Phillips is running more advantaged crudes with 67% of Phillips U.S. crude in advantaged crude compared to 57% in the fourth quarter of last year. 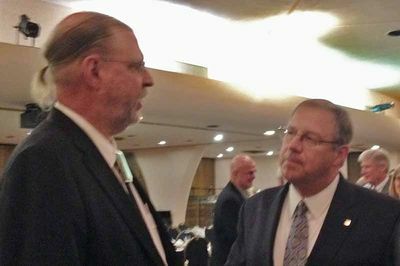 Greg Garland told analysts at the 4th quarter earnings conference on January 30, 2013 that improvements in feedstock advantage increased earnings in the Gulf Coast by over $200 million and by over $100 million in the Central Corridor. "The positive $3.69 per barrel adjustment per feedstocks stems from running certain crudes and other feedstocks that are priced lower than our benchmark crudes," said Garland. "For example, our feedstock advantage this quarter was primarily related to running for an heavy-sour crudes at our Gulf Coast refineries and Canadian crudes in our refineries in the Central Corridor. In addition, our crude slate is increased to include more shale crudes, primarily Bakken and Eagle. Finally, the other category primarily reflects the impacts of volume gain and product differentials." The Boston Globe reported on January 8, 2013 that Global Partners LP has signed a five-year contract with Phillips 66 to deliver crude oil from North Dakota to Bayway Refinery using its rail transloading, logistics, and transportation system to deliver about 91 million barrels of crude oil to the Phillips refinery over the life of the contract. That equates to approximately 50,000 barrels per day. “Global has established a ‘virtual pipeline’ for the reliable transportation of Bakken crude,” said Tim Taylor, Executive Vice President, Commercial, Marketing, Transportation & Business Development of Phillips 66. “Our five-year agreement with Global assures us long-term access to advantaged crude for our Bayway refinery through what we believe is a cost competitive origin-to-destination supply system to the East Coast.” The Bakken crude oil is expected to be transloaded at Basin Transload LLC’s North Dakota rail facilities. Phillips 66 reported at their inaugural Analyst Meeting on December 13, 2013 that they had recently signed time charter agreements for two medium-range Jones Act marine vessels that will supply the Alliance and Bayway refineries, and potentially the company’s other Gulf Coast refineries, with Eagle Ford crude beginning in early 2013. Fuelfix reported on September 19, 2012 that with new shale crudes coming on there has been a structural change in crude prices that presents a real opportunity for the U.S. refining businesses. "You still have 2 to 3 million barrels a day of new light sweet crude coming on out of these new shale plays," said Garland. "And I think ultimately there’s 2 to 3 million barrels a day of Canadian heavy that comes south. I think the U.S. is going to find itself, particularly the mid-continent areas and the Gulf Coast areas — where 51 percent of our capacity is — with an advantaged crude price versus the rest of the world. That’s a structural change." Greg Garland told investors and securities analysts at the 2012 Barclays CEO Energy-Power Conference in New York on September 5, 2012 that all three business segments, the R&M business, the Midstream business, and the Chemicals business, are well positioned to take advantage of the prolific shale plays and the Canadian heavy. "A big source of competitive advantage we think we can have in our business is the access to advantaged crudes. It's 75% of our cost structure, a lot of work going across the Company in accessing these advantaged crudes." Paragon reported on August 15, 2012 that new crude production from Texas and the Midwest has resulted in profits reaching their highest levels since 2007 with the difference between the cost of crude and the price companies could sell fuel 9crack spread) in the April-June quarter at $29.05 a barrel according to data collected from Bloomberg. "The prospects for U.S. refiners have turned around dramatically," said John Auers, senior vice president of Turner Mason & Co., a petroleum and refinery consulting company. "Cheap crude has given an advantage to the U.S. refining system, already the most advanced, most complex and most efficient in the world." U.S. refiners have outperformed all other energy sectors in the S&P 500 Index with an average gain of 42 percent. In comparison the S&P 500 Integrated Oil & Gas Index has gained just 2.85 percent year-to-date. Michael Fitzsimmons wrote on Seeking Alpha on August 1, 2012 that in February2, 102 Fitzsimmons wrote that the price differential between WTI and Brent (then $19/barrel) would tighten up once the Seaway pipeline was reversed. "I was wrong in my prediction. What I missed was the huge increase in oil production coming out of the Bakken (now over 600,000 bpd) and Eagle Ford shales," writes Fitzsimmons. "While I was expecting production to increase, I had no idea it would increase at such a rate as to pretty much fill up Seaway and still be left with the same problem as before it was reversed." Reuters reported on Phillips second-quarters earnings report on August 2, 2012 that Phillips 66 plans to buy 2,000 railcars to move cheap crude from North Dakota's Bakken shale play to the Bayway plant and its 100,000 bpd plant in Ferndale, Washington. Bayway already runs 10,000 to 20,000 bpd of Bakken crude. Streetinsider reported on Jun 5, 2012 that Phillips may purchase a "couple thousand" additional rail cars to provide transportation from US shale formations to refineries. The railroad cars would cost $200 million and enable Phillips to carry 120,000 barrels of oil a day from mid-continent, where oil is cheaper, to Phillips coastal refineries. "We're going to add rail capacity," said Garland. "We're considering buying a couple thousand more railcars so we can get Bakken crude either east and west." The initial goal is to increase delivery of shale crudes to Phillips refineries by 100,000 to 150,000 bpd within two years using railroad unit trains. "That's a pipeline on wheels. So, that could go to the Bakken. It could go to the Niobrara. It can shift as the opportunity shifts around the country." Many analysts say rail will be a bigger part of the oil delivery picture for years because shale wells - often scattered, small and of uncertain lifespan - won't justify pipeline construction. On June 5, 2012 Phillips CEO Greg Garland presented to the Citi Global Energy Conference and said Phillips has a clear strategy for growth and improving returns. Garland said Phillips is kind of an average performer in terms of returns on Refining and Marketing with a 12% ROCE in this business, but the expectation is thatthis can be improved to a 15% ROCE business over the cycle. "The R&M business for us is a run well, optimized business. You won’t see us adding capacity. You will see us investing around the infrastructure to put more advantaged crude to the front end of the refineries and to be able to export." There is another way Phillips would like to improve returns in the refining business and that is by getting advantaged crude to the front end of the refineries. "Today we can process about 500,000 barrels a day of TI-related and about 100,000 barrels a day of shalerelated crudes. If you think about the mid-con, we think there’s about 2 million barrels a day of new light sweet crude coming on in the central part of the US. Then you’ve got another couple million barrels a day of the Canadian heavy that’s ultimately going to make its way down through the midcontinent and ultimately, we believe to the Gulf Coast. And so every dollar that we can capture across our system is worth about $500 million of net income to us." So Phillips is going to go around pipelines and is considering buying a couple thousand more rail cars to get Bakken crude either east and west. "We’re running about 100,000 barrels a day of these shales today and we think we can easily in the next year or two move another 120-150,000 barrels a day of incremental crude through rail. Plus as these pipeline solutions become more available and ready, we’ll capture those opportunities. But ultimately, we can process about 500,000 barrels a day of these shale-type crudes." Simone Sebastian reported in the Houston Chronicle on July 2, 2012 that the nation's energy transportation network is undergoing a multibillion-dollar overhaul, as oil and natural gas production surges in new regions of the country and energy producers charge into new areas with technology that can reach oil and natural gas trapped in shale and other tight rock formations leaving pools of crude and gas stranded far from the Gulf Coast refineries and petrochemical plants that need them. "Where it used to be isn't where it is now. Where it needs to go isn't where it used to go," says Terrance McGill, president of fuel carrier Enbridge Energy. "You're seeing this fundamental shift of crude oil across the country." Phillips 66 CEO Greg Garland says his company is considering buying 2,000 more rail cars that could carry an additional 150,000 barrels a day from shale regions (PDF) to its refineries across the country because the glut of crude oil pouring out of the newly tapped shale oil plays like North Dakota’s Bakken has kept the price of Mid-Continent crude at a record-wide discount of up to $27 per barrel relative to its rival European benchmark Brent crude because there is not enough pipeline capacity to get Bakken crude to Gulf coast refineries. "That's a pipeline on wheels," says Garland. "You'll see us stepping out and doing some more things around infrastructure. Like everyone else, we're doing everything we can to get more barrels in front of those facilities." NASDAQ reported on May 24, 2012 that according to Clayton Reasor, Phillips 66's senior vice president of strategy and corporate affairs, the price spread between West Texas Intermediate crude and Brent crude futures is likely to narrow sharply in 2013 as increased domestic pipeline capacity relieves the glut created by new shale-oil supplies. "The WTI-Brent differential will narrow as the onshore pipeline capacity is built up and removes some of the bottlenecks that exist between Cushing and the Gulf Coast," said Reasor. Janet McGurty wrote in the Calgary Herald on May 22, 2012 that Kinder Morgan’s Pony Express Pipeline and Belle Fourche Pipeline are looking for shippers to use their newly planned pipeline to send their light, sweet crude from outside Baker, Montana, just over the state line from North Dakota’s booming Bakken oil shale play, about 1,000 miles southeast to Ponca City, home of Phillips 66 refinery before continuing on to the oil storage hub of Cushing, Oklahoma. Once the Pony Express reaches Cushing it will be near the Seaway pipeline, now able to carry 150,000 bpd of oil to the Gulf Coast with expansion plans to over 400,000 in the works. Although plans are on the book to move Bakken crude north and east, production in the region topped 510,000 bpd in March and is expected to continue to expand. Gregory J. Millman wrote in the Wall Street Journal on May 15, 2012 that mid-continent refineries have access to high quality crudes that are cheap because there are no pipelines to carry them to world markets, and therefore they are in superabundant supply. Since the product price is a world market price, and refineries have access to export markets, those that can use cheaper crudes enjoy fatter margins and are more profitable than those who cannot. Simon Moore writes on Seeking Alpha on May 10, 2012 that with all the new piplines getting ready to come online to move Bakken Oil to Cushing, starting material for refineries in the Mid-Continent Segment will soon become relatively cheaper which will benefit Phillips 66 with three Gulf coast refineries with a total capacity of 733 MMbpd for the next several years. Moore notes that the Seaqay Pipline reversal will go online on May 17, 2012 brining 150,000 barrels/day of light sweet crude from Cushing, Oklahoma to the Gulf Coast and there are currently plans to expand the pipeline to approximately 400,000 barrels/day and then to 850,000 barrels/day. In addition the new Flanagan South Pipeline will move another 585,000 barrels/day from Illinois to Cushing. Finally the Bakken Express Pipeline from Oneok (OKE) will move 200,000 barrels/day from the Bakken to Cushing. "PSX stands to benefit from the extra crude that will be piped from Cushing to the Gulf Coast increasingly over time." Kristen Hays wrote on Reuters on May 1, 2012 that Greg Garland says the Phillips 66 aims to process more shale oil "everywhere we can get it." Garland added that several refineries are already well positioned to receive shale oil, such as its 247,000 barrels-per-day (bpd) refinery in Sweeny, Texas, in proximity to the state's prolific Eagle Ford shale play, or Midwest plants. The company last fall also ran unit trains from the Bakken shale oil play in North Dakota to its 238,000 bpd Bayway refinery in Linden, New Jersey, and has taken trains to West Coast refineries. "You'll see us stepping out and doing some more things around infrastructure," he said. "Like everyone else, we're doing everything we can to get more barrels in front of those facilities." Garland told the Houston Chronicle on May 1, 2012 that investments in refining will enhance its export abilities and connections to lower-cost crude. "But you won't see us investing to increase refining capacity," Garland says. Garland says that Phillips 66 will execute a number of strategies to revitalize the refining business. Phillips 66 will target lower-cost oil and focus more of its refining capacity on producing diesel and other high-yield fuels. The company also will ramp up exports to foreign markets that offer higher prices for their fuel. Greg Garland disclosed during the 4th quarter earnings conference call on January 29, 2014 that Phillips exported nearly 200,000 barrels a day. "Our total export capacity is just over 400,000 barrels per day, up from 285,000 barrels at the end of 2012." Garland added that the increase in export capacity is primarily Gulf Coast. "I think we will continue to push the limits. We are looking for cheap ways that we can just get more barrels across there. Certainly, we have stated our ultimate target is about 500 a day, but almost all that increase is going to be on the Gulf Coast. Minor debottlenecks on the West Coast, and then we have underutilized capacity today on the East Coast." Graphic from Phillips Presentation to USB Global Oil and Gas Conference May 21, 2013. Barron's reported on September 15, 2015 that House Republicans plan to vote on a bill in the coming weeks to lift the nation’s 40-year-old ban on crude oil exports. More than a dozen oil companies— a list that includes Continental Resources (CLR), ConocoPhillips (COP). and Marathon Oil (MRO) .—have pushed Congress to lift the ban, arguing that unrestrained domestic oil exports would eliminate market distortions, streamline U.S. production and kindle the U.S. economy. House Majority Leader Kevin McCarthy (R., Calif.) is expected to announce the vote, being scheduled for the last week of September, at a Tuesday speech in Houston. While the legislation is likely to pass the GOP-controlled House, its prospects in the Senate are less clear. The White House hasn’t taken a position on the issue. The American Journal of Transportation reported on September 9, 2015 that Phillips 66’s investments in storage and pipeline infrastructure in southeastern Texas give the company an “option on exports” should the decades-old domestic crude export ban be lifted, Chief Executive Officer Greg Garland told analysts. “I do think people will make investments to support export infrastructure and we want to do that too,” Garlands aid during a webcast presentation at the Barclays CEO Energy-Power conference in New York. In 2014 Phillips 66 acquired a 7.1 million barrel crude and refined products terminal in Beaumont, Texas, that Garland said was “really an option on crude exports.” The terminal has two Aframax-capable docks and a barge dock. It also has rail and truck offloading facilities. Phillips is a 25 percent partner in two Energy Transfer Partners pipeline projects that aim to move North Dakota Bakken and Canadian heavy crude to Sunoco Logistics Partners’ storage terminal in nearby Nederland by late 2016. Kristen Hays reported at Reuters on August 13, 2014 that Phillips is evaluating the export of super-light crude oil known as condensate, after two industry peers received U.S. government approval to ship it overseas after minimal processing but declined to say if it has sought formal permission to export condensate from the U.S. Department of Commerce, which is tasked with interpreting exceptions to a decades-old ban on crude exports. "We're evaluating the process and seeking a better understanding," said Chris Chandler, Phillips 66's head of natural gas liquids (NGLs). "That process is still a little unclear to us." Asked if the export facility could potentially export condensate that has been minimally processed, Chandler said: "This Freeport facility has a lot of expansion possibilities. It's close to the Gulf of Mexico, three miles from open water. We have the capability of doing a lot more here than we do currently." Reuters reported on April 11, 2014 that after securing an export license in 2013, Phillips is now exporting oil to Canada. A Phillipsspokesman declined to say where in Canada its exports are headed and in what volume and did not disclose if the oil will reach its destination via rail or barges. "As a matter of practice, Phillips 66 does not comment on commercial activity," said spokesman Dennis Nuss. The United States does not allow exports of its own oil, but makes exceptions such as barrels going to Canada and re-exports of foreign oil. Reuters reported on April 11, 2014 that Phillips plans to build a condensate splitter at Sweeny refinery which will allow it to process condensates into fuel components that can be exported. Bloomberg reports that the oil industry is pressuring President Barack Obama to end the 41-year-old ban on most crude exports but British Petroleum (BP) isn’t waiting for a decision. The British oil giant has signed on to take at least 80 percent of the capacity of a new $360 million mini-refinery in Houston that will process crude just enough to escape restrictions on sales outside the country. “It’s a relatively inexpensive way around the export prohibition,” says Judith Dwarkin “You can lightly ruffle the hydrocarbons and they are considered processed and then they aren’t subject to the ban.” Amid a flood of new US oil], the demand for simple, one-step plants capable of transforming raw crude into exportable products such as propane is feeding a construction boom along the Gulf Coast. The first such mini-refinery, built for 1/10 the cost of a complex, full-scale refinery, is scheduled to open the first phase of its 100,000 barrel-a-day crude processing plant in July, The mini-refineries take advantage of the law that allows products refined from oil to be sold overseas, though not the raw crude itself. "The international buyers of these products will likely need to refine them further, so this is basically a veiled form of condensate exports,” says Leo Mariani. According to Bloomberg, three additional plants have been proposed by other pipeline or trading companies, and refiners including Valero and Phillips said they may follow suit. Christopher Helman wrote at Forbes Magazine on February 19, 2014 that increasingly, the oil giants seem to have realized that there’s better returns to be made, with fewer headaches, by turning their focus back to the USA and that it’s the smaller operators that have been able to capitalize best on the unconventional oil and gas revolution. "Thanks to the U.S. oil boom, refineries in this country are chronically oversupplied with cheap oil (as witnessed by the discount of WTI to Brent) and will continue to be as long as oil exports remain prohibited. This frustrates the small independent drillers who would like to sidestep the refiners and export their crude to the world market (if it weren’t prohibited). But it’s not so bad if you happen to own a refinery; then you can capture much of that differential by exporting finished gasoline and diesel to the world market," writes Helman. "That’s why Exxon, Chevron and Shell are unlikely to jettison any U.S. refineries as long as this dynamic remains. On the contrary, notes Deutsche Bank’s oil analyst Paul Sankey, we may soon see the day when a big independent oil producer buys a small refining company — “relative multiples would make this a highly accretive move,” Sankey wrote." Greg Garland told security analysts at the Credit Suisse Global Energy Summit on February 12, 2014 that Phillips is well placed to compete in the export market. "We have 7 coastal refineries, so roughly 75% of our domestic capacity is on the coast. These are going to be the best position refineries to participate in the export opportunities that we see," said Garland. "We believe that you're going to have to access the export markets to be able to continue to run high utilization rates and hence our focus on growing our export capability to 500,000 barrels a day." Garland said that in December we sold 250,000 barrels a day to Latin America and South America. "We do believe that the U.S. refining business is really well positioned to compete in those export markets. You have an energy price advantage over European and Asian refiners. You have -- you're in the right zip code so you have a transportation cost advantage. Then you factor in an advantaged crude position. So these refineries and when you look at the complexity, size and the scale of the U.S. refining business, well positioned to compete in the export markets. That's true of Phillips 66 also." In response to a question from Doug Leggate of Merrill Lynch, Greg Garland reiterated his support for crude exports during the 4th quarter earnings conference call on January 29, 2014. "I think I came out in May of 2012, and said we wouldn't be opposed to lifting the ban on crude exports. We do encourage a thoughtful and broad conversation around energy policy in our country, and I think you have got to look at that holistically. It is not just crude exports, but it is also infrastructure. And that could be pipelines, that could be marine, and I think you just can't take one of them and pull it out separately. So we don't oppose lifting the crude ban. But I think you have got to look at RFS. You have got to look at infrastructure pipeline. Can we approve a pipeline or not in this country? All the way to marine infrastructure limitations that we have in this country. So and generally we are free-traders, but we would like to see a free market also." Greg Garland disclosed during the 4th quarter earnings conference call on January 29, 2014 that Phillips exported nearly 200,000 barrels a day. "Our total export capacity is just over 400,000 barrels per day, up from 285,000 barrels at the end of 2012." Garland added that the increase in export capacity is primarily Gulf Coast. "I think we will continue to push the limits. We are looking for cheap ways that we can just get more barrels across there. Certainly, we have stated our ultimate target is about 500 a day, but almost all that increase is going to be on the Gulf Coast. Minor debottlenecks on the West Coast, and then we have underutilized capacity today on the East Coast." Greg Maxwell, Executive Vice-President for Finance and Phillips CFO, told analysts at the UBS Global Oil and Gas Conference on May 21, 2013 that Phillips is increasing export capabilities. "We have projects in progress to increase export capability from our Gulf Coast and our West Coast refineries by 115,000 barrels per day over the next few years. And during the first quarter, we moved 150,000 barrels per day into the export market. And these projects position us with the capability to export up to 30% of our total clean product production from our coastal refineries." Michael Fitzsimmons wrote in Seeking Alpha on January 10, 2013 that Fitzsimmons has a theory as to why Phillips CEO Garland has unpredictably come public in December in support of is supporting crude oil exports: Could it be that Phillips 66's position on the crude oil export question goes back to its relationship to - ConocoPhillips? After all, Fitzsimmons says, since the spin-off many COP executives and employees likely hold stock in PSX, and vice-versa. Fitzsimmons says that COP produces over 130,000 boe/day of high quality light-sweet crude in the Eagle Ford - very close to PSX's Texas refineries. "Even though the companies are now separate publicly traded entities, you know that COP and PSX management talk turkey quite often. So I wonder what PSX might get from COP in return for publicly supporting crude exports? First dibs on Eagle Ford production at a favorable rate? Discounts on natural gas feedstock for its refinery and chemical operations? Discounts on WCS from COP's top-tier position in the Canadian oil sands? The point is this - by working in tandem, there is certainly room for COP and PSX to optimize the overall returns for both companies." "While an easing of the crude oil export ban will likely reduce the Brent/WTI spread and thus crimp profits in the company's refining sector, I take it as a very bullish and almost cocky indicator of the confidence PSX management has in its future - exports or no exports. I also believe COP and PSX will work closely together to maximize the benefits to both companies should the ban on crude oil exports be lifted or substantially eased - something I see as very likely." Reuters reported on December 13, 2013 that Phillips 66 CEO Greg Garland told reporters at a lunch in New York that Phillips would support exports of crude oil from the United States, arguing the boost they would give the country's economy would trump the higher costs for the company and for American consumers. "When you think about what is good for U.S. economy, what drives job growth... all of these are reasons why we support crude oil exports," said Garland. "If we're allowed to export refined products I think others should be allowed to export the crude they produce." Garland is the first head of a major refiner to speak openly in favor of exporting crude. The United States in the past three years has become a major exporter of gasoline, jet fuel, and diesel as domestic demand has fallen in reaction to higher prices and a slow economic recovery. Some say the decades old ban on crude oil exports is outdated should North America become energy independent in the coming years, though it is likely to be a fiercely fought political issue. Garland said that U.S. sea-borne crude oil imports could be as low as 2 million barrels per day (bpd) within five years. The drop in sea-borne imports, from a peak above 8 million bpd in the middle of the last decade, has led many to speculate the U.S. could eventually become a net exporter of crude. Garland praised the cheap energy-led "renaissance" in American manufacturing. "We consider ourselves a manufacturing company... Last year the biggest export from the United States was not planes or automobiles but refined products - and that's the first time since the 1940s." FuelFix reported on September 19, 2012 that Phillips 66 exported about 100,000 barrels a day and plans to increase daily exports to 220,000 by the end of 2013. "If we can export to make more money, we’ll do that. If we can sell in the U.S. and optimize earnings, we’ll do that too. But to date, exporting has actually gotten us a higher price than selling in the U.S." Garland added that it doesn't take a huge investment to increase exports. "These aren’t huge investments. It’s access to tanks and pipes and dock space. It’s less than $100 million of investment for us to do this." Garland says that demand is down in the United States, so increasing exports is beneficial for the country. "Last year, the U.S. industry’s No. 1 export oil products, gasoline and diesel essentially. When we think about exports, we think it’s great for the country. It makes jobs for us. Ultimately, I think it results in better prices for American consumers. We are running our refineries harder, we are spreading those fixed costs over more barrels. So what you are seeing is relatively high utilization rates in the U.S. refining industry today even though demand has been down." Greg Garland told security analysts at the Credit Suisse Global Energy Summit on February 12, 2014 that there's $60 million to $100 million of value creation by pushing our clean yields. 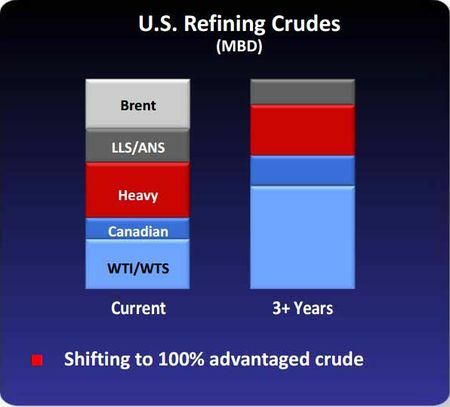 Graphic from Phillips Presentation to USB Global Oil and Gas Conferecne May 21, 2013. Phillips announced during their earnings release on July 29, 2016 that the Bayway Refinery is undergoing an FCC modernization to increase gasoline yield, expected in 2018. Greg Garland told analysts during the 2016 second quarter earnings conference call on July 29, 2016 that "At Bayway, work on the FCC modernization is progressing. These are all high return, quick payout projects." Phillips announced during their earnings release on July 29, 2016 that Wood River Refinery has debottlenecking and yield improvement projects that are scheduled for completion in the third quarter. Greg Garland told analysts during the 2016 second quarter earnings conference call on July 29, 2016 that "t the Wood River Refinery, we're undergoing debottlenecking and are on schedule for completion in the third quarter. At the Billings Refinery, efforts are underway to increase the amount of heavy Canadian crude we can run to 100%. At Bayway, work on the FCC modernization is progressing. These are all high return, quick payout projects." The Midland Reporter-Telegraph reported on October 26, 2015 that construction recently began for a new hydrotreater at the Lake Charles Refinery to meet federal Tier 3 standards for lower sulfur content in gasoline for the beginning of 2017. Phillips 66 also is considering building a new hydrocracker or other potential upgrades in order to produce road-grade diesel fuels that would be more marketable in the U.S. The Lake Charles Refinery currently produces lots of diesel, but it is high-sulfur diesel that must be sold internationally or in the Northeast as home heating oil, said Reinery Manager Steve Geiger. Phillips 66 has resisted the expansion thus far because the demand from foreign markets remains strong, Geiger said. “We’re going to spend money where we get the best return,” Geiger said. Houston Business Journal reported on October 21, 2015 that Phillips 66 is stacking the deck at their Lake Charles Refinery to take advantage of what the company sees as a strong future for diesel products. "We continue to look into opportunities to get into fuel-grade diesel," said Steve Geiger, general manager of the refinery in Lake Charles, known in the company as the Lake Charles Refinery. According to Geiger the Lake Charles Refinery is already stacked to maximize diesel production, but not the fuel-grade diesel that drivers of light-duty vehicles are most familiar with. Phillips 66's Lake Charles complex currently only produces diesel products with 2,000 ppm of sulfur, also considered "high-sulfur" diesel, which is used by only certain non-road, locomotive and marine vessels. However, diesel fuels used in light-duty vehicles are expected to grow in market share by significant strides in the coming decades and Phillips 66 is actively looking to produce fuel-grade diesel at Lake Charles. According to Geiger Phillips 66 is considering adding a hydrocracker to produce ultra-low sulfur diesel at its Lake Charles Refinery. "We can't make road grade diesel," Geiger said. "We're looking at several different options: hydrocracking, hydrotreating, a revamp." Additionally, the refinery plans to replace the four drums on the fuels Coker in 2017. Geiger declined to say when the work was scheduled and when it is due to take place on the year. The drums have reached the end of their operational life. Greg Garland told security analysts at the Credit Suisse Global Energy Summit on February 12, 2014 that there's $60 million to $100 million of value creation by pushing our clean yields. Greg Garland told analysts at the fourth quarter earnings conference on January 29, 2014 that Phillips benefited from clean product differentials. "During the quarter, we realized better prices on average for clean products, compared with the benchmark prices. In addition, as RIN prices moderated, the benefit of resulting lower expenses is reflected in this bar." Greg Maxwell, Executive Vice-President for Finance and Phillips CFO, told analysts at the UBS Global Oil and Gas Conference on May 21, 2013 that Phillips plans to increase product yields. "Over the last few years, we've increased our total clean product yields by 2% percent with an emphasis on maximizing our diesel yield. As you know, global demand for diesel is strong and growing. Our distillate yield is 3% higher than the United States industry average. 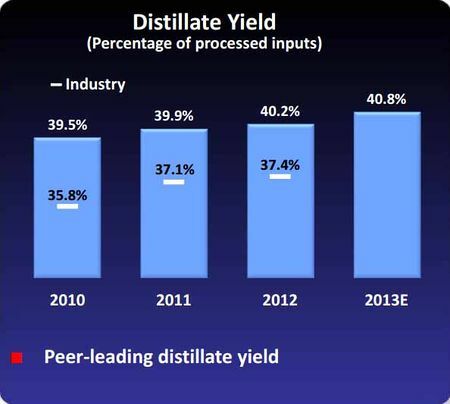 And we believe we have a peer leading distillate yield. This is worth approximately $150 million in net income per year based on today's market prices. And 11 of our refineries have small projects to increase both clean product and diesel yields." "As we look at our refining business, we pulled capital down over the past couple years. Our sustaining level of capital in the R&M segment is about $1 billion a year. We will focus some incremental spend in R&M on margin improvement projects. We think that there's opportunities to capture more feed stock advantaged crudes. We can drive our clean product yields, increase our export capability. 1% improvement in clean product yield gives us about $100 million to $150 million of net income improvement. If we can capture $1 a barrel of WTI/Brent differential, it's worth about $90 million of net income. There is powerful economic incentives to capture these margin improvements." On June 5, 2012 Phillips CEO Greg Garland presented to the Citi Global Energy Conference and said Phillips has a clear strategy for growth and improving returns. Garland said Phillips is kind of an average performer in terms of returns on Refining and Marketing with a 12% ROCE in this business, but the expectation is thatthis can be improved to a 15% ROCE business over the cycle. "The R&M business for us is a run well, optimized business. You won’t see us adding capacity." Phillips wants to increase yields in the refineries. "Every one percent clean product yield is worth somewhere between $100 to $150 million of net income. For every one percent diesel yield, we can increase, in today’s market is the capture of about $60 million in net income. In the first quarter we ran about 41% diesel, which is really the highest of the peer group if you look out there. And so we’re pretty comfortable that we can continue to tweak the operations in refineries and to eke out a couple more percentage points in clean product yields and continue to push our diesel yields up without significant investment at this point in time. ↑ Barclays CEO Energy-Power Conference. "Presentation by Greg Garland" September 3, 2014. ↑ Phillips 66. "Phillips 66 Reports Second-Quarter Earnings of $496 Million or $0.93 Per Share" July 29, 2016. ↑ Seeking Alpha. "Phillips 66 Reports Second-Quarter Earnings of $496 Million or $0.93 Per Share" July 29, 2016. ↑ Phillips 66. "Phillips 66 presents at the Bank of America Merrill Lynch 2016 Refining Conference" March 3, 2016. ↑ Argus Media. "Phillips 66 charts additional path to Bayway" September 10, 2015. ↑ Reuters. "Big Rail's little cousins find boon in U.S. oil-by-rail bust" by Jarrett Renshaw. September 1, 2015. ↑ Phillips 66. "Second Quarter 2015 Earnings Conference Call" July 31, 2015. ↑ Reuters. "Phillips 66 says adding railcars to move crude to coastal refineries" September 3, 2014. ↑ Reuters. "U.S. refiners turn to tanker trucks to avoid 'dumbbell' crudes" by Kristen Hays. March 23, 2015. ↑ Argus Media. "Analysis: Cushing storage on track to fill by May" March 2, 2015. ↑ BDM.com "Cheap gas prices not all good news: Metro-east oil companies affected" by Will Buss. January 5, 2015. ↑ Argus. "Ferndale refinery unloads first Bakken train" November 21, 2014. ↑ Phillips 66. "PSX - Q3 2014 Phillips 66 Earnings Call" October 29, 2014. ↑ Businesswire. "Phillips 66 Becomes Joint Venture Partner with Energy Transfer to Build Bakken Crude Oil Pipelines" October 28, 2014. ↑ Argus Media. "Phillips 66 to build Bakken rail facility" September 3, 2014. ↑ Seeking Alpha. "Phillips 66's (PSX) CEO Greg Garland on Q2 2014 Results - Earnings Call Transcript" July 30, 2014. ↑ The Motley Fool. "The Death of the Brent-WTI Spread: Are Refiners Going to Get Crushed?" by Isac Simon. March 12, 2014. ↑ Seeking Alpha. "Phillips 66's CEO Discusses Q4 2012 Results - Earnings Call Transcript" January 30, 2013. ↑ Reuters. "Phillips 66 may buy more railcars to move crude to U.S. refineries-CEO" October 30, 2013. ↑ FuelFix. "Phillips 66 earnings fall with disappointments" by Zain Shauk. July 31, 2013. ↑ Econobrowser. "Brent-WTI spread disappears-- for now" by James Hamilton. July 21, 2013. ↑ Phillips 66. "Phillips 66 presentation at UBS Global Oil and Gas Conference" May 21, 2013. ↑ Fox Business. "Phillips 66 Profit Surges; Aims to Use All Cheap, Domestic Crude" May 1, 2013. ↑ Bloomberg. "Phillips 66 Signs Deals to Boost Oil Deliveries by Pipe, Rail" by Eliot Caroom. March 20, 2013. ↑ Bloomberg. "Phillips 66 Signs Deals to Boost Oil Deliveries by Pipe, Rail" by Elliot Caroom. March 20, 2013. ↑ Boston Globe. "Global Partners and Phillips 66 sign long-term crude oil contract" by Chris Ready. January 8, 2013. ↑ Businesswire "Global Partners and Phillips 66 Sign Long-Term Crude Transportation and Logistics Contract" January 8, 2013. ↑ Phillips 66. "Phillips 66 Announces 2013 Capital Program and Intent to Form MLP" December 13, 2012. ↑ FuelFix. "Phillips 66 CEO says exports will ease U.S. refining challenges" September 19, 2012. ↑ Phillips 66. "2012 Barclays CEO Energy-Power Conference" presented by Phillips CEO Greg Garland. September 5, 2012. ↑ Paragon. "U.S. Refiners Soaring in 2012" August 15, 2012. ↑ Seeking Alpha. "Phillips 66 Hits A Home Run" by Michael Fitzsimmons. August 1. 2012. ↑ Streetinsider. "Phillips 66 (PSX) May Look to Add 'Couple Thousand' Rail Cars in Effort to Expand Capacity" June 5, 2012. ↑ Fox Business. "Phillips 66 To Boost Rail Capacity for Oil Transport - FT" June 6, 2012. ↑ Reuters. "Phillips 66 to buy 2,000 rail cars to transport oil" June 8, 2012. ↑ Phillips 66. "Greg Garland's 2012 Presentation to the Citi Global Energy Conference" June 5, 2012. ↑ Houston Chronicle. "Nation's energy transportation getting a revamp" by Simone Sebastian. July 3, 2012. ↑ Slashdot. "US Energy Transportation Gets Multibillion-Dollar Revamp" by Hugh Pickens. July 2, 2012. ↑ NASDAQ. "Phillips 66 Executive: WTI-Brent Spread To Narrow Sharply By 2013" May 24, 2013. ↑ Calgary Herald. "Kinder Morgan to begin Pony Express crude pipeline" by Janet McGurty. May 22, 2012. ↑ Wall Street Journal. "Delta Refines A Fallacy" by Gregory J. Millman. May 15, 2012. ↑ Seeking Alpha. "Phillips 66: A Lot Of Upside Potential" by Simon Moore. May 10, 2012. ↑ Reuters. "Phillips 66 aims to run more shale oil" by Kristen Hays. May 1, 2012. ↑ Houston Chronicle. "Phillips 66's route to focus on refining, pipelines" by Simone Sebastian. May 1, 2012. ↑ Forbes Magazine. 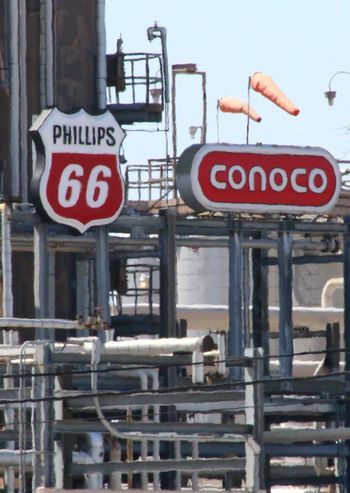 "As ConocoPhillips Spins Off Refining Assets, Think Twice Before Buying The New Phillips 66" by Christopher Helman. April 30, 2012. ↑ Phillips 66. "Q4 2013 Phillips 66 Earnings Conference Call" January 29, 2014. ↑ Barron's. "After 40 Years: Vote Planned on Bill to Lift Oil Export Ban" by Johanna Bennett. September 15, 2015. ↑ American Journal of Transportation. "Phillips 66 southeast Texas projects are an ‘option on exports’" September 9, 2015. ↑ Reuters. "Phillips 66 says evaluating condensate export process, seeking clarity" by Kristen Hays. August 13, 2014. ↑ Fuelfix. "Refining chief: We don’t oppose US oil exports" by Ryan Holeywell. May 7, 2014. ↑ Reuters. "Phillips 66 says exporting U.S. oil to Canada" April 11, 2014. ↑ Bloomberg. "BP Splitter Refinery Seen Skirting U.S. Oil Export Ban" by Alex Nussbaum and Bradley Olson. March 6, 2014. ↑ Slashdot. "BP Finds Way To Bypass US Crude Export Ban" by Hugh Pickens. March 7, 2014. ↑ Slashdot. "US Now Produces More Oil and Gas Than Russia and Saudi Arabia" by Hugh Pickens. October 7, 2014. ↑ Seeking Alpha. "Phillips 66 Unpredictably Supports Crude Oil Exports - Why?" by Michael Fitzsimmons. January 10, 2013. ↑ Reuters. "Refiner Phillips 66 would support U.S. crude oil exports-CEO" December 13, 2013. ↑ Midland Reporter-Telegraph. 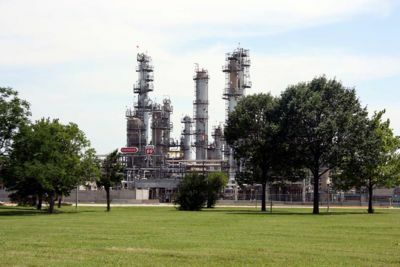 "Phillips 66 grows in Texas; Louisiana to feed refineries" by Jordan Blum. October 26, 2015. ↑ Houston Business Journal. "Phillips 66 bets on diesel" by Suzanne Edwards. October 21, 2015. ↑ Reuters. "Phillips 66 eyes adding hydrocracker at Lake Charles refinery" October 20, 2015. ↑ Phillips 66. "Phillips 66 presentation at UBS Global Oil and Gas Conference " May 21, 2013. This page was last modified on 31 July 2016, at 15:26. This page has been accessed 17,829 times.